This program includes part of the original New Holland tractor training package. Investigate the menus to find gearbox and transmission controls. Click on the forward arrow to cycle through every frame and then investigate or operate each component with your mouse or touchscreen. Click on the left or right side of the knobs to rotate them. 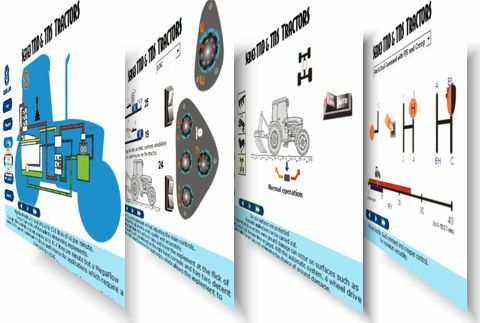 Learn about some of the key hydraulic components within a tractor hydraulic system. Note that the hydraulic screen has two sections that can be accessed via the refresh sign. Investigate the four-wheel drive controls and learn when to use them.